Gluten free protein powders are not too difficult to find, especially with growing demand for this type of product. However, gluten free mass gainers are extremely difficult to make and pickings can be very slim. As such, this is a short article which outlines some of the best gluten free mass gainers on sale today in Australia. Before beginning our list, we should point out that products manufactured outside of Australia are not required to be tested for gluten-free claims. Instead, it is up to the manufacturer to declare whether or not the product is gluten-free. In quite a few instances, a careful look at many products that claim to be gluten free actually reveals that they are processed on facilities that also handle wheat. As such, if you are severely gluten-intolerant, this is something to keep in mind when doing your shopping. While the Elemental Nutrition Peptide Protein isn’t your standard mass gainer due to its lack of carbs, the formula is definitely geared towards trainers wanting to gain lean muscle. The Peptide Protein is a high quality hydrolysed whey protein providing a high percentage of di- and tri-peptides, which are short chains of amino acids. These are preferentially absorbed and therefore provides the muscles with the necessary nutrients much faster than other types of protein powder. Use correctly, Peptide Protein can help to kick start muscle building processes much faster and help support better gains. Although technically considered a post workout supplement, GENr8 Vitargo Post can also be utilised as a mass gainer protein. With 20g of protein and 71g of carbohydrates per serve, it offers a decent dose of calories and is perfect as a post workout shake to help support faster recovery and kick start muscle building as quickly as possible. 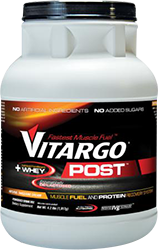 If you want to boost lean muscle mass quickly, Vitargo Post is definitely one of your best choices. Dymatize actually make a gluten-free claim across the majority of the proteins in their brand. They manufacture a variety of different mass gainers with varying levels of carbs to suit every body type and trainer type. 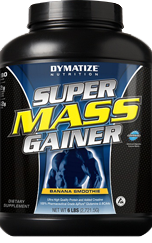 Dymatize Super Mass Gainer is an ultra high carb and calorie gainer that is designed for hard gainers. If you really struggle to put on weight, this is the product for you. Then there is Dymatize Mega Gainer. This is the in between mass gainer from Dymatize. It is suitable for the vast majority of the population and provides a solid amount of carbs without going overboard. Dymatize are well known for making some of the best protein powders on the market such as their Elite Whey and ISO 100. They are also one of the rare companies who make a gluten free mass gainer and the two listed above are definitely excellent choices for those who are looking to pack on some serious mass. Add to that a gluten free multivitamin and essential fatty acid supplement and you have an excellent mass gainer that will rival any premixed product. This article is written with the best information available at the time of writing and serves only as a guide. The author cannot personally guarantee these products are gluten-free. Product formulations and labelling claims may change without notice and it is up to the consumer to ensure that products are indeed gluten-free.